You arrive at the bus stop, ready to catch your bus: a line that advertises arrivals every 10 minutes. You glance at your watch and note the time... and when the bus finally comes 11 minutes later, you wonder why you always seem to be so unlucky. When waiting for a bus that comes on average every 10 minutes, your average waiting time will be 10 minutes. This is what is sometimes known as the waiting time paradox. I've encountered this idea before, and always wondered whether it is actually true... how well do those "reasonable assumptions" match reality? This post will explore the waiting time paradox from the standpoint of both simulation and probabilistic arguments, and then take a look at some real bus arrival time data from the city of Seattle to (hopefully) settle the paradox once and for all. This weekend I found myself in a particularly drawn-out game of Chutes and Ladders with my four-year-old. If you've not had the pleasure of playing it, Chutes and Ladders (also sometimes known as Snakes and Ladders) is a classic kids board game wherein players roll a six-sided die to advance forward through 100 squares, using "ladders" to jump ahead, and avoiding "chutes" that send you backward. It's basically a glorified random walk with visual aids to help you build a narrative. Thrilling. But she's having fun practicing counting, learning to win and lose gracefully, and developing the requisite skills to be a passionate sports fan, so I play along. On the approximately twenty third game of the morning, as we found ourselves in a near endless cycle of climbing ladders and sliding down chutes, never quite reaching that final square to end the game, I started wondering how much longer the game could last: what is the expected length of a game? How heavy are the tails of the game length distribution? How succinctly could I answer those questions in Python? And then, at some point, it clicked: Chutes and Ladders is memoryless — the effect of a roll depends only on where you are, not where you've been — and so it can be modeled as a Markov process! By the time we (finally) hit square 100, I basically had this blog post written, at least in my head. When I tweeted about this, people pointed me to a number of similar treatments of Chutes & Ladders, so I'm under no illusion that this idea is original. Think of this as a blog post version of a dad joke: my primary goal is not originality, but self-entertainment, and if anyone else finds it entertaining that's just an added bonus. Python is quick and easy to code, but can be slow when doing intensive numerical operations. Translating code to Cython can be helpful, but in most cases requires a bit of trial and error to achieve the optimal result. Cython's tutorials contain a lot of information, but for iterative workflows like optimization with Cython, it's often useful to see it done "live". For that reason, I decided to record some screencasts showing this iterative optimization process, using an Ising Model, as an example application. I installed package X and now I can't import it in the notebook. Help! This issue is a perrennial source of StackOverflow questions (e.g. this, that, here, there, another, this one, that one, and this... etc.). Fundamentally the problem is usually rooted in the fact that the Jupyter kernels are disconnected from Jupyter's shell; in other words, the installer points to a different Python version than is being used in the notebook. In the simplest contexts this issue does not arise, but when it does, debugging the problem requires knowledge of the intricacies of the operating system, the intricacies of Python package installation, and the intricacies of Jupyter itself. In other words, the Jupyter notebook, like all abstractions, is leaky. First, I'll provide a quick, bare-bones answer to the general question, how can I install a Python package so it works with my jupyter notebook, using pip and/or conda?. Second, I'll dive into some of the background of exactly what the Jupyter notebook abstraction is doing, how it interacts with the complexities of the operating system, and how you can think about where the "leaks" are, and thus better understand what's happening when things stop working. Third, I'll talk about some ideas the community might consider to help smooth-over these issues, including some changes that the Jupyter, Pip, and Conda developers might consider to ease the cognitive load on users. This post will focus on two approaches to installing Python packages: pip and conda. Other package managers exist (including platform-specific tools like yum, apt, homebrew, etc., as well as cross-platform tools like enstaller), but I'm less familiar with them and won't be remarking on them further. 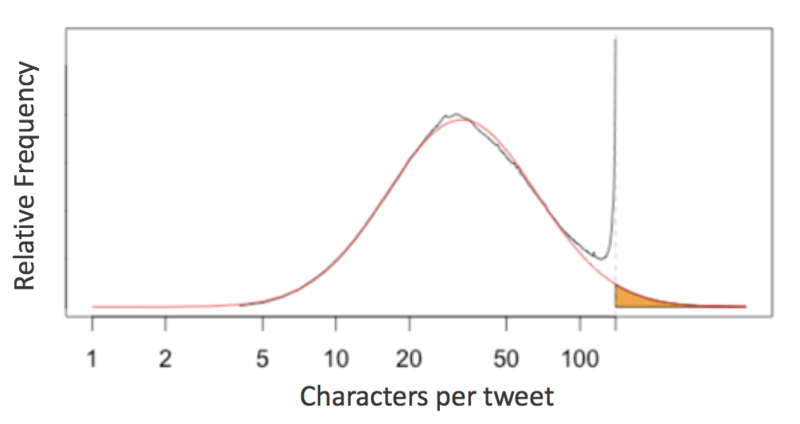 The analysis takes this as evidence that twitter users often "cram" their longer thoughts into the 140 character limit, and suggest that a 280-character limit would more naturally accommodate the distribution of people's desired tweet lengths. I began to wonder whether popular Python packages (e.g. NumPy, SciPy, Pandas, Scikit-Learn, Matplotlib, AstroPy) display anything similar to what is seen in the distribution of tweet lengths. Spoiler alert: they do! And the details of the distribution reveal some insights into the programming habits and stylistic conventions of the communities who write them. I just got home from my sixth PyCon, and it was wonderful as usual. If you weren't able to attend—or even if you were—you'll find a wealth of entertaining and informative talks on the PyCon 2017 YouTube channel. "PEP509 added a private version number... every dictionary has a version number, and elsewhere in memory a master version counter. And when you go and change a dictionary the master counter is incremented from a million to a million and one, and that value a million and one is written into the version number of that dictionary. So what this means is that you can come back later and know if it's been modified, without reading maybe its hundreds of keys and values: you just look and see if the version has increased since the last time you were there." "[The version number] is internal; I haven't seen an interface for users to get to it..."
which, of course, I saw as an implicit challenge. So let's expose it! This week I published the preprint of a manuscript that started as a blog post, but quickly out-grew this medium: Understanding the Lomb-Scargle Periodogram. Figure 24 from Understanding the Lomb-Scargle Periodogram. The figure shows the true period vs the periodogram peak for a simulated dataset with an observing cadence typical of ground-based optical astronomy. The simulation reveals common patterns of failure of the Lomb-Scargle method that are not often discussed explicitly, but are straightforward to explain based on the intuition developed in the paper; see Section 7.2 for a detailed discussion. Over the last couple years I've written a number of Python implementations of the Lomb-Scargle periodogram (I'd recommend AstroPy's LombScargle in most cases today), and also wrote a marginally popular blog post and somewhat pedagogical paper on the subject. This all has led to a steady trickle of emails from students and researchers asking for advice on applying and interpreting the Lomb-Scargle algorithm, particularly for astronomical data. I noticed that these queries tended to repeat many of the same questions and express some similar misconceptions, and this paper is my attempt to address those once and for all — in a "mere" 55 pages (which includes 26 figures and 4 full pages of references, so it's not all that bad). I've found one of the best ways to grow in my scientific coding is to spend time comparing the efficiency of various approaches to implementing particular algorithms that I find useful, in order to build an intuition of the performance of the building blocks of the scientific Python ecosystem. Edit: a reader pointed out that the original creator of this animation posted it on reddit in 2016. Naturally, I immediately wondered whether I could reproduce this simlulation in Python. This post is the result.